Oh, goodness. How do you say "I am mortified" in French? 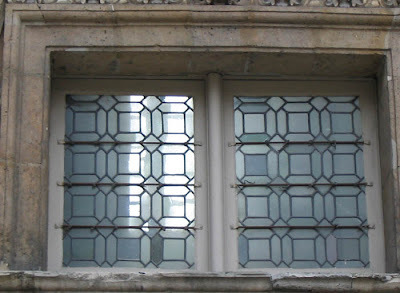 Of course, the photos from the last post were not, as advertised, the Carnavalet. They were the Hôtel Sully, also in the Marais. What puzzles me is how I didn't glom on to that fact while I was putting up the photos -- because when I couldn't find this, it should have been a dead giveaway that I was barking up the wrong hôtel. 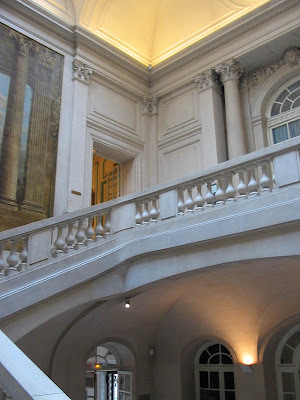 This is the wonderful staircase that Virgina featured on her blog and made me remember how much I enjoyed the Carnavalet in the first place and sent me down this garden path. For some reason, these photos weren't loaded onto my hard drive, I had to go digging for the actual CD and I guess I was just too lazy to do that on January 20. 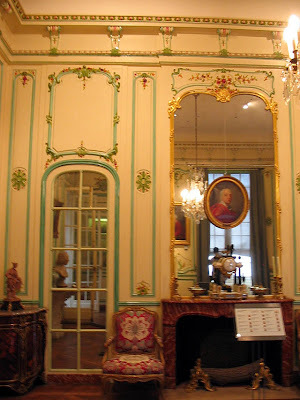 I beg a thousand pardons and hereby try to make up for it with actual photos of the actual Musée Carnavalet. Random window, the sort of shot that I love to inflict on folks. 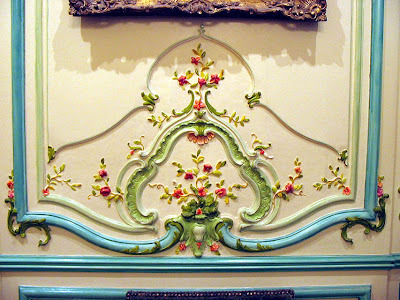 This woodwork utterly delighted me. What a cheerful, merry place this room must have been. From the sound of things, Parisians can really relate to this one about now. Ahhh. This is what Paris is all about, non? What an amazing, wonderful face. That's the face of a woman I could be best girlfriends with. According to the legend under the photo, if I read it correctly (it's en francais), she was a comedienne who specialized in servant and soubrette roles, and was murdered at a very young age. I have always meant to find out more about her -- she is absolutely compelling to me. 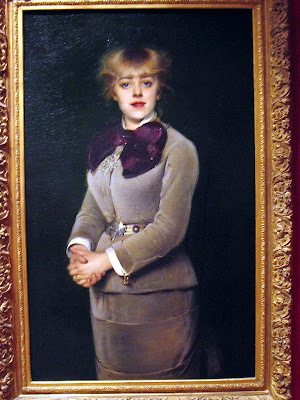 I've seen some other portraits, including one by Renoir, but I like this one best. 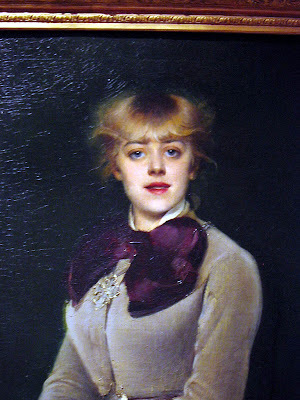 The artist was a woman -- perhaps she had the same response to Mlle Samary that I did. So that's it. I hope I've made up for my tremendous gaffe last week! I promise to be more careful from here on in! Virginia posted this photo the other day, which I recognized instantly. It made me smile, remembering what a beautiful building it was, and how much I'd loved that staircase. 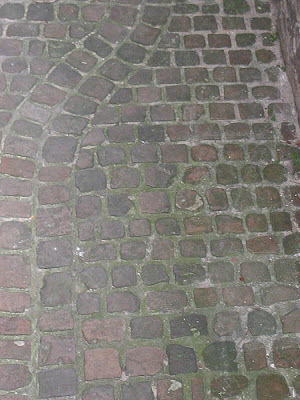 I stood on it for quite a while, as I recall. I'm not sure why I didn't take a picture. So glad Virginia did. The museum is wonderful, a little-known gem, and should not be missed. Plus, getting there is a great excuse to have a little wander around the Marais, which is never a bad thing. OY! 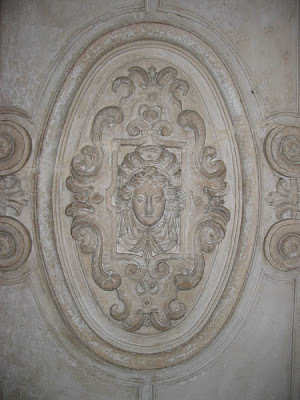 I am soooooo embarrassed, but I believe Virginia is correct -- this is the hotel Sully, NOT the Carnavalet. 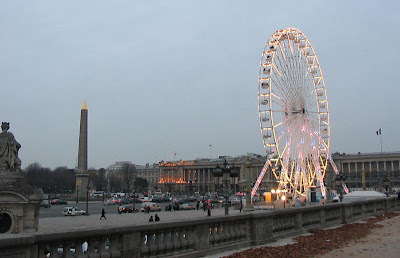 Oh, dear -- it's been so long since I've been to Paris that my memories are getting fuzzy. 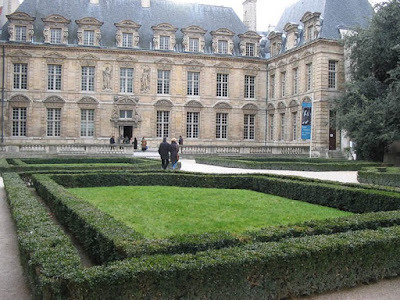 Now I have to go seek out some actual photos of the actual Carnavalet. The best way I can think to start off a new year is with pictures of Paris -- since I can't actually be there to enjoy it in person. These are from November 2007, which was my last trip. I cannot believe it has now been more than two years since I was in Paris -- the very thought of that makes me heart hurt a little. Considering my first trip was August of 2005 and between then and the November of 2007 I managed to squeeze in four, to have now gone for more than two years is heart-rending. But circumstances, as they say, intervene. Things are looking good now for May, and thinking about it lifts my spirits considerably. It was cooooooooold this trip. It may have been colder than when I was here in February of that year. Love that long winter light -- even in the dead of winter in Austin (such as it is), the light never gets that steep. We're just too far south. 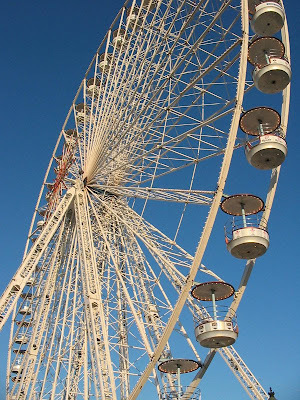 I don't ride ferris wheels, but I sure like looking at them. Especially in the cold winter dusk. It will be warm when I'm in Paris next, and I'm glad of that because I'm not naturally a cold weather person (which is a grand understatement). 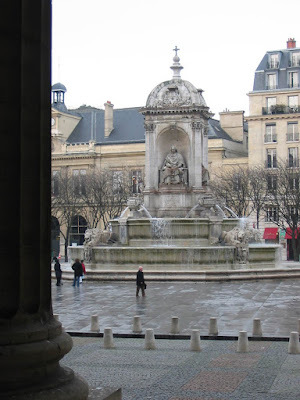 But there is a wonderful chilly melancholy about Paris in the winter that I really do love. Except without the wings, of course. 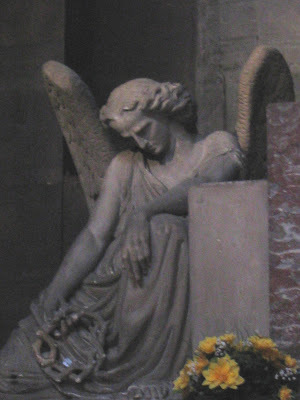 This angel was in Saint Sulpice. 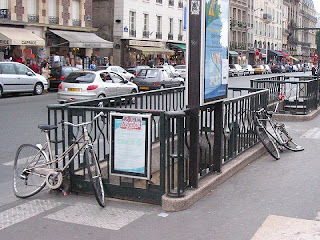 (It's a dreadful picture and I apologize for that, but I took all these photos with a little Canon A60 point & shoot that I bought prior to my first trip to Paris in August of 2005. I've accumulated some skill at getting it to do what I want it to, there are manual settings I can futz with, but I'm no photographer and mostly I just let the camera do its best.) This is from my February 2006 trip, when it was bitter cold and gray just about the whole time I was there. 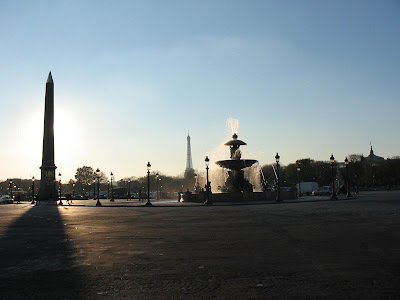 One of my favorite blogs is Virginia Jones' Paris Through My Lens. Virginia is a wonderful photographer and she uses her skills to illuminate Paris and other parts of France, a place she obviously loves as much as I do. 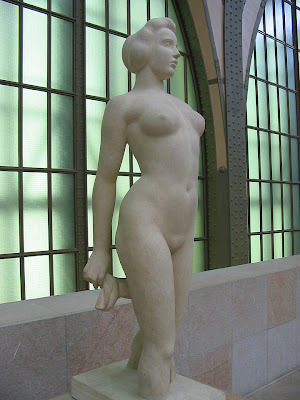 Yesterday she inspired me with a post about the juxtaposition of the artwork and the architecture in the fabled Musée d'Orsay. 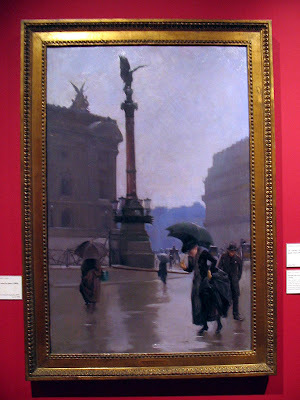 The d'Orsay isn't my favorite museum in Paris -- I'm much more of a modern & contemporary art person, so while I appreciate the beauty of all this gorgeous 19th Century (-ish) stuff, it doesn't really tug at me like the things you might find in the Palais de Tokyo or (my favorite museum on Earth) the Tate Modern. Or a new great favorite, the Modern in Ft. Worth -- I had a delirious afternoon there earlier this year, in a delighted stupor of architecture worship and art overload. If you can get there, GO!! The most wonderful thing about the d'Orsay (to me) is that is used to be a real, live building before it was a museum -- it was a train station and thank heavens the resourceful Parisians decided it was better to save it and bung a lot of art into it than tear it down and lose an irreplaceable and extraordinary example of fin de siècle architecture. Forthwith, some of my favorite photos from my visit there, in August of 2005. 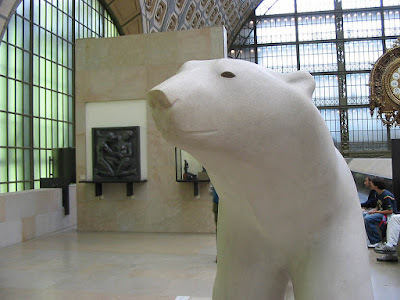 I think the bear might have been my favorite thing in the whole building -- isn't he delightful? (Not to mention that his creator was named "Pompon!" How fun!) 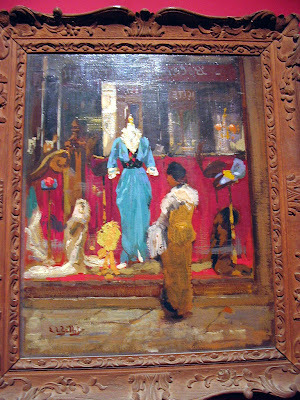 Click on the captions for more information about the works. 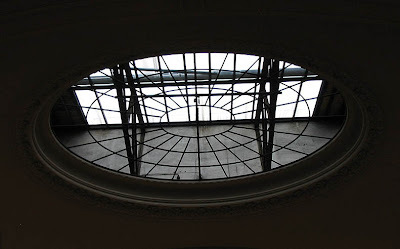 As you can see, even in the Musée d'Orsay, my eye goes to the most modernistic of the artwork. 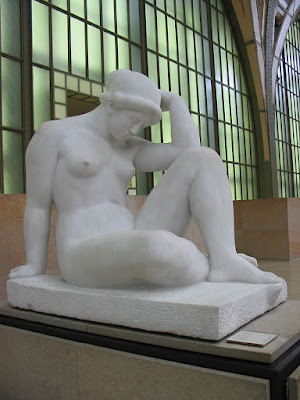 Everyone raves about the passion and emotive qualities of Rodin's sculpture, but I'm much more moved by the serenity & simplicity of Maillol's. So thanks, Virginia, for inspiring me to look back on these great works! Look closely at the bikes in this photo. I took this on my first trip to Paris, in August of 2005. 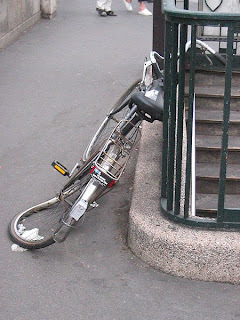 For some unfathomable reason, I saw this several times while I was there -- bikes with hopelessly bent wheels chained to subway gates or some other structure. Were they injured after they were locked to the gates? Are they waiting there for someone to pick them up & fix them, or perhaps scavenge them for parts? (They seem perfectly good other than the bent wheels, and the wheels can be replaced.) Are they abandoned? Are they art? I never figured it out. This is my friend Billy, who lives in Paris. I do not believe he was born in Paris, he went there when his person, Nicole, moved to the city. 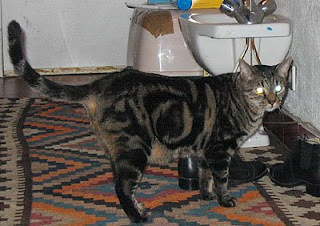 He's a gorgeous fellow, incredibly sweet, and he's a Thumping Cat. Petting is all well & good, but if you really want to make Billy happy, you thump him. Smack him rather like a bongo drum all up & down his back. I don't know why it makes him happy, but it does. Good enough for me. with his person, Nicole. Nicole is the sister of my old & dear friend Dominique, with whom I often stay when I visit Paris. 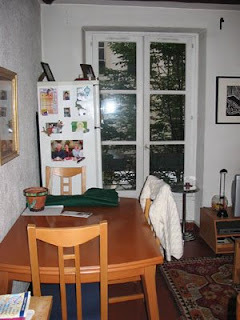 For years, this is the apartment where Dominique & her son lived, and on my first trip to Paris I stayed here with the two of them. 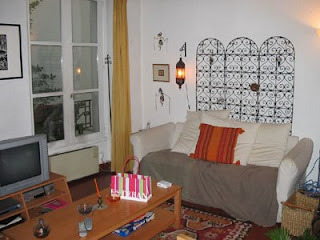 Small apartment, very close quarters, and still -- amazing hospitality from my friend. 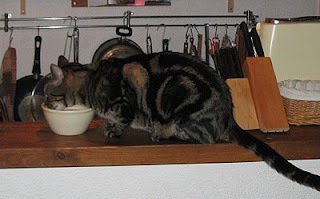 Dom & Seiya have since moved two doors down to a much bigger place, and now Nicole is living in this apartment again (she'd sublet it to Dom while she was living out in the 'burbs for a while). I've stayed here a couple of times on my own, because Nicole is frequently out of town and when my visit coincides with her leaving I get to stay in her adorable little apartment in Montourgueil and pretend I'm an honest-to-god Parisian, and she gets someone who can take care of Billy while she's away. Everyone wins, especially me. The only thing better than wandering the streets of Paris all day long is coming home to a sweet cat who's happy to see me at the end of said day. He's got quite a good loud purr, does Billy. This is my angel, my darling, my beating heart, my Shine. Today is her 6th birthday. (Well, today is her birthday observed. 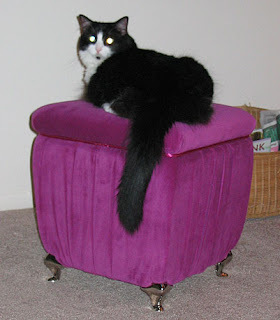 She was a rescue cat and so I'm not sure of her exact birthday. Her vet & I made an educated guess.) Shine is not French, she is Texan through and through, but I do think she'd do very well in Paris. She's friendly and gorgeous, and black & white is always chic. Happy Birthday, my babycat.